I often get asked “How did you start your blog?” and “Do you have any tips for me if I’m just getting started?” I’m not very good at answering these questions, particularly the second one because what worked for me in 2011 when I started my blog is probably outdated today. But I do have one tip that will stand the test of time: Make good blog friends. I’ll never forget the week I started my blog (waaaay back in 2011). Jack and I had worked really hard to choose recipes, learn to take flattering pictures of food (harder than you think! ), and design/program a good looking website. We made the website live and I wondered if my mom would be our only reader. One day, while Jack was trying to explain to me how Twitter works, there was a sudden “BLEEP” from my computer… someone had tagged me in a tweet that said “Love and Lemons is love at first sight,” and it was from an account called Cookie and Kate. 30 seconds later, “bleep bleep bleep bleep bleep”… re-tweets and messages started flashing in and I squealed with both Tweety confusion and excitement that this blog thing was going to work. Of course, there would be years and mountains of (mostly free) work ahead of me before I could call this labor of love a job… but it had to start somewhere, little by little. In my case, this start was initiated by one kind soul who was the first to share a slice of her readership with me. Fast forward to now… Cookie and Kate has become one of my favorite vegetarian blogs to read and Kathryne has become one of my very best blog friends. 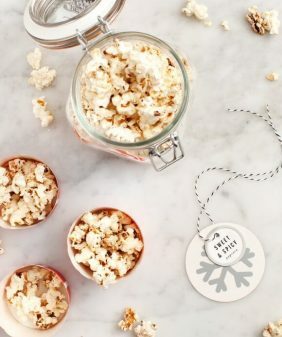 If you aren’t following her blog, you should – she makes delicious, attainable vegetarian food and her first cookbook, Love Real Food, is a real stunner. I’ve read it cover to cover and I have one tip for you: don’t read it while you’re hungry! I drooled over recipes like Roasted Eggplant Lasagna, Chickpea Tikka Masala, and Fresh Greek Nachos before stopping at her gorgeous peanut butter chocolate chip cookies. These cookies are so delicious and SO quick to make. It’s a one bowl recipe that results in decadent, soft pillowy cookies that are lightly crisp on the outside. 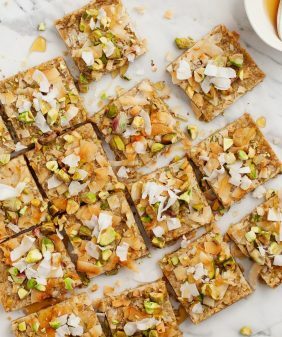 These little guys contain no flour (so they’re naturally gluten and grain free) and they’re sweetened with coconut sugar. I made my cookies with eggs as the recipe states, but Kathryne also gives a vegan option in the footer of the recipe which I’ll include here as well. I’ll be making these Greek Nachos with Herbed Tahini this week – yum! Love Real Food comes out tomorrow – go get yourself a copy! 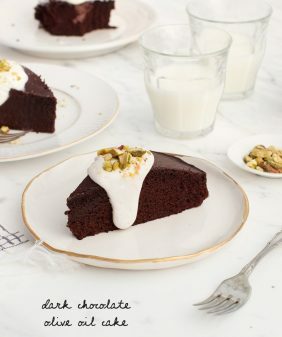 Recipe from Love Real Food by Kathryne Taylor. Reprinted with permission from the publisher. Add the peanut butter and whisk until the dough is smooth and the peanut butter has completely blended into the batter (you might need to switch to a big spoon toward the end, which you'll need for mixing in the chocolate chips, anyway). Add the chocolate chips and stir until the chocolate chips are evenly incorporated. Make these vegan by using vegan chocolate chips and omitting the eggs. Kathryne notes that egg free cookies will be lighter and have a more meringue-like in texture that's slightly gritty. These cookies look delicious! 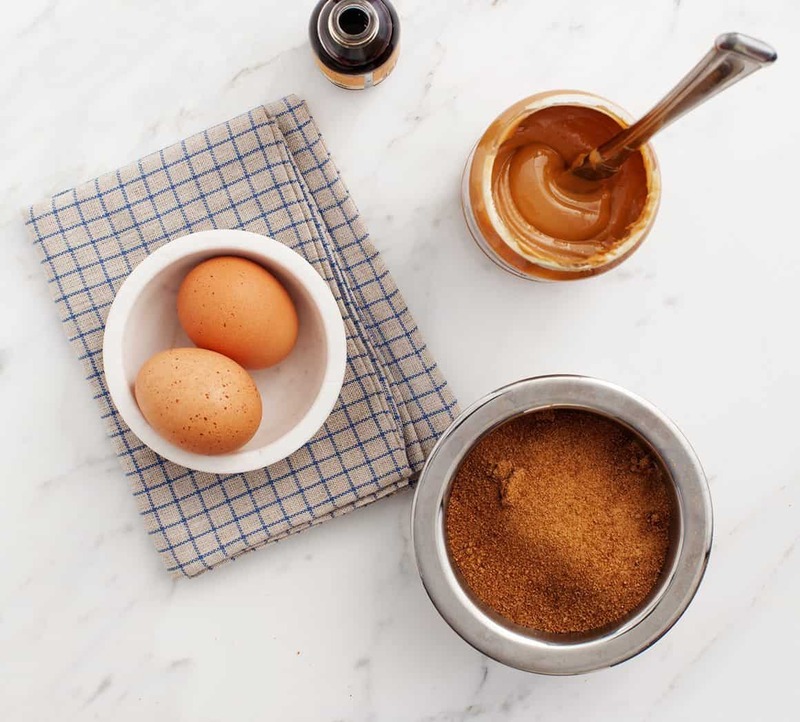 One question… since I am not a fan of coconut sugar, is there a suitable alternative? Thanks! Hi Patricia, I’m pretty sure regular sugar or raw cane sugar would work too! So essentially, it’s baked peanut butter, sugar and chocolate chips??? yep (and eggs) but they turn into cookies once baked – really delicious. And, the 2nd WOW to how clean this is!! I am curious to try this with my powdered peanut butter and add in my own coconut oil (throw it in the blender). I’ll let you know how it goes! I’m so excited!! Can’t wait to try these! I LOVVVVE both “Love and Lemons” and “Cookie and Kate”! I have your Love and Lemons cookbook and I’m excited for the arrival tomorrow of my copy of “Love Real Food”! !❤️ Thank you Ladies for keeping us healthy and clean in our eating and always so bountifully beautiful in color! Ordered! Thanks for the tasty reminder to grab this book. So nice to hear bloggers supporting each other. I looOOoove both of your blogs! I AM a pb lover like you so yesss I love these cookies! I can imagine how soft and chewy and just full of pb deliciousness they are! they are very peanut buttery – I hope you love them! 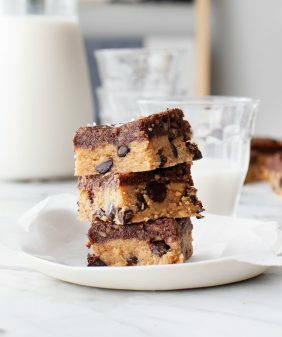 Can I use peanut butter without hydrogenated oils in this recipe? yes, i used natural peanut butter. If you use un-salted peanut butter add an additional 1/4 teaspoon of salt to the recipe. I love her blog!! Excited for the book as well:) Those cookies look delicious! 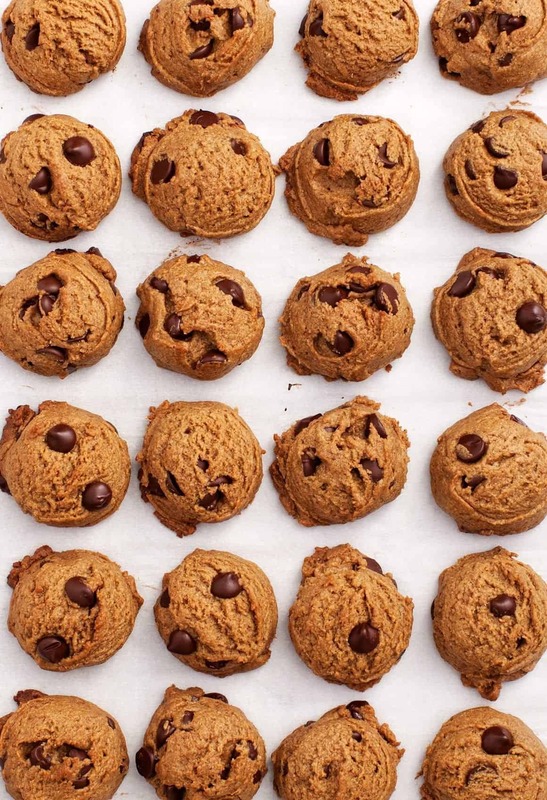 Peanut butter and chocolate chip are the best of both worlds!! I suppose you could substitute aquafaba for the eggs to make it vegan. Definitely going to try this one! What great advice! You might not know it, but you are my blog friend! LOL. Love Katherine…and these cookies. Weekend project! I made these cookies last night and they are the most delicious ever! They taste a little like peanut butter fudge with chocolate chips! Here is a huge advantage that does not apply to most L & L readers: I live in Leadville, Colorado, which has an altitude of 10,200′ . Cooking is tricky, especially baking (and beans and pasta, but that is another story). These cookies completely sidestep the altitude adjustment issue because they do not have any leavening (except eggs) and do not rise–just get a little puffy. Just take them out of the oven when they appear to be just a tad underdone and the are perfect! Awesome! Awesomely perfect! These will be my go-to cookie for every event requiring cookies, forever and ever Amen! Inspired! Thank you so much! Should we adjust the sugar (granulated sugar) amount if we use regular semi-sweet chocolate chips? Hi Thuy, I haven’t tried so I can’t say how reducing the sugar might change the texture. Such a nice story 🙂 Blogging really is a labor of love isn’t it? And it really does take time, piece by piece, little by little. But making connections (whether it’s with readers or other bloggers) is what it’s all about! Both your blog and C&K are two of my favorites. These cookies look divine! Has anyone tried to swap almond butter for the peanut butter? 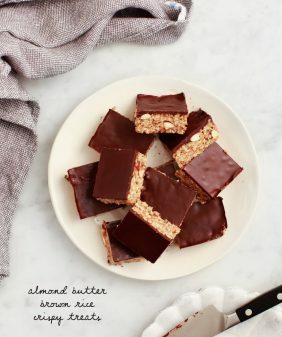 Hi Nicole – in her book Kathryne says that almond butter will work! What a sweet, sweet story — and great advice too. The cookies look tasty as well! 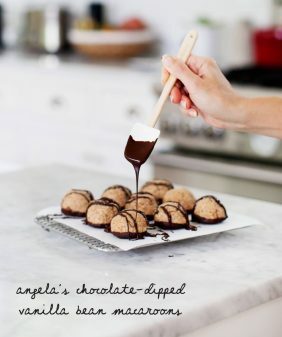 These look delicious, going to make them tonight! Question: any idea of the calorie count? Thanks in advance. Jeanine, thanks again for this post! Your cookies and photos look SO good. See you next week! These cookies look delicious. I need a new choc chip cookie recipe so I’m going to try this on the weekend. I liked reading about when you started out! Thanks Didi – I hope you enjoy the cookies! Can I freeze these whether prior to baking to save for another day or post-baking? The mix makes too many and I’m worried I’ll eat them all!